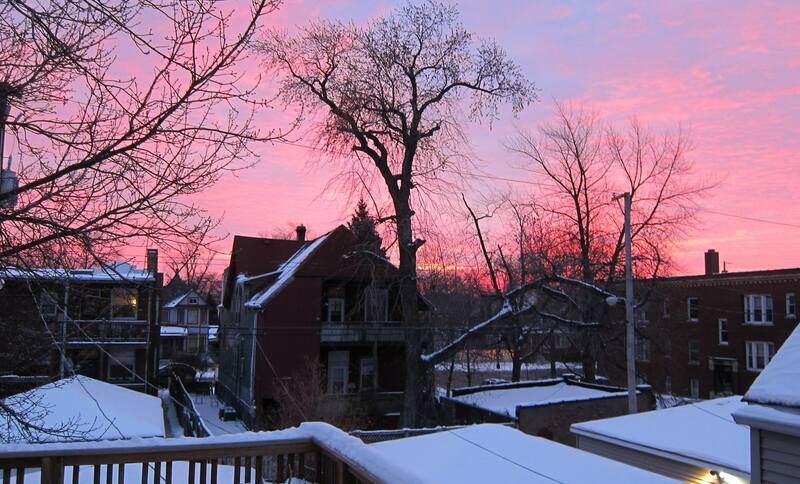 One of many views of a mid-winter Chicago sunrise. More examples below. Credit: Christy Prahl. 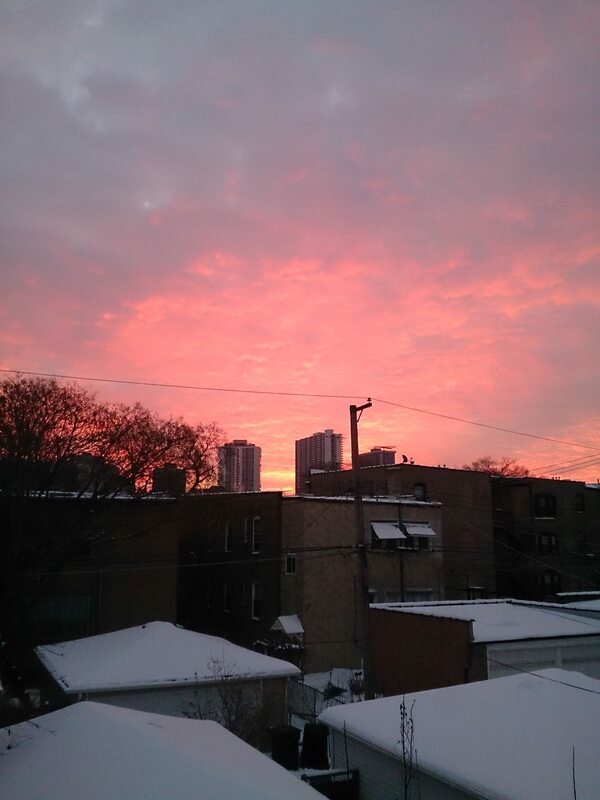 The crowd-sourcing of sunrises is one of my favorite midwinter* traditions. When the book of face glows with oranges, pinks and purples, we share the relief of the ancients. Once again the days are stretching, and I have the stats of moderns (below) to prove it. 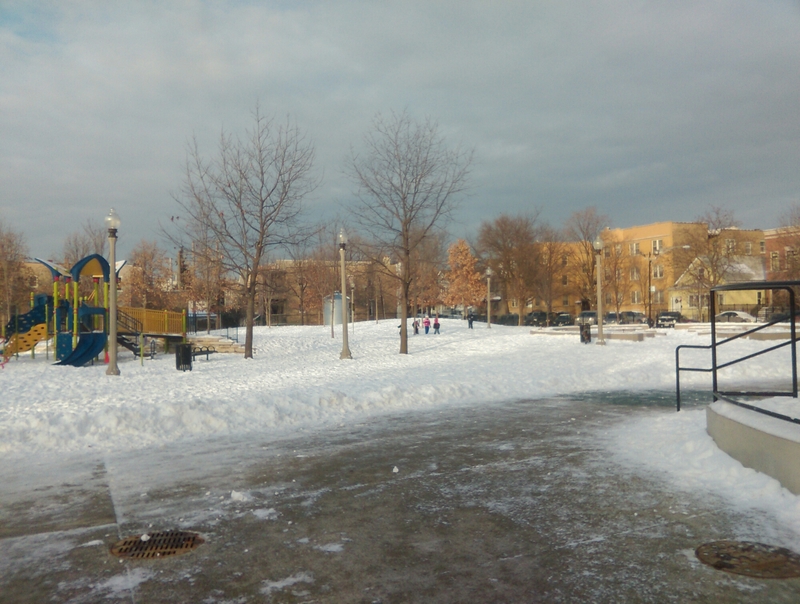 I noticed a hint of brightness yesterday, while huddled with some friends at the playground. Our children were romping in the snow after school. The gray sky was lighter than dark. It was as though a film of gloom had peeled away from the familiar scene. Yesterday’s after school scene at Goethe’s playground. It was brrrrr, but bright. It’s still cold, and it will be cold for months to come, with little regard for the growing arc of the sun. That’s the Chicago way. By the time it’s warm enough** to enjoy late sunsets, the days will already be shrinking; the summer solstice marks the slide back to winter. Our “skyline” view. That’s a streetlight, not the sun. That’s why I watch the sun now, nose and camera against the windows. Even though I can’t touch it, I can trust it. There will be a chilly day in mid-March when I can count the tips of tulips in the back yard, then sit against the south facing wall to soak up the warmth starting to collect in the yellow bricks. If you also like to track the daylight, here are some stats and dates to keep your chin (and eyes) up even when the temps remain low. Note that the meridian today is at high noon. The stats are courtesy of TimeandDate.com. Fun website! My math might need checking. Hours today: 9:28:31, which means we have gained about 21 minutes in less than 4 weeks. 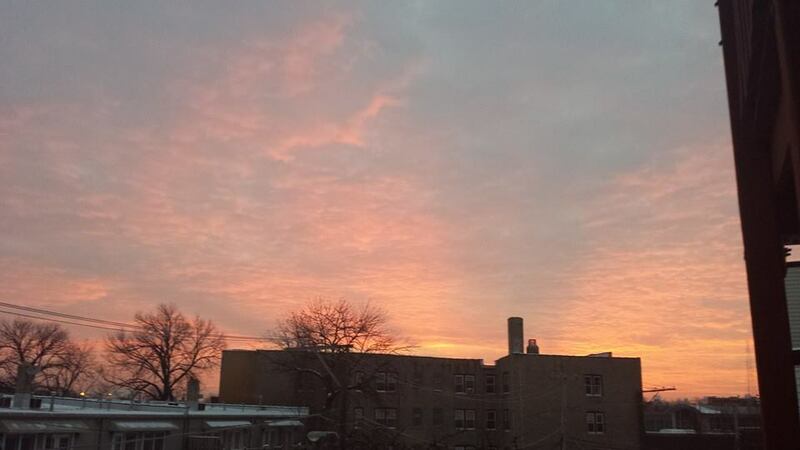 January 28 is when the sunset will hit 5pm. Hours in day: 9:53, which means about 24 minutes more than today. On February 15, the sun will rise at 6:47am, which is about when Miguel wakes up. Hours in day: 10:36:46. On March 7th, the sun will rise at 6:16, which is when I often meet friends for morning runs. Yay for sunny runs! On March 8th, we will be plunged back into morning darkness. This is my least favorite day of the year. However, the sun will set at “6:49pm” after 11:36:16 hours of daytime. June 21st is the longest day, at 15 hours, 13 minutes, and 43 seconds, which is about 6 hours and 5 minutes more than the shortest day. Sunrise: 5:15 Sunset 8:29. It’s all downhill from there! **I’m not warm until it’s 75 degrees. And that’s a stretch.